Home / Uncategorized / New (old) intaglios! I hope your new year is off to a nice start! Mine is moving slowly, which is actually a nice change of pace. Winter has set in here in the Pacific Northwest, and it tends to make me feel like hibernating … or at very least, resting up beside the fire with my beads. One goal that I’m working on for the year ahead is to (finally!) get all of my inventory photographed and listed here on the site. While I have a pretty good selection of beads and stones listed already, I have a lot more to add! I also have a lot of pieces that I hope to re– photograph, since my camera and skills have improved considerably in the years since I first photographed many of these beautiful beads. 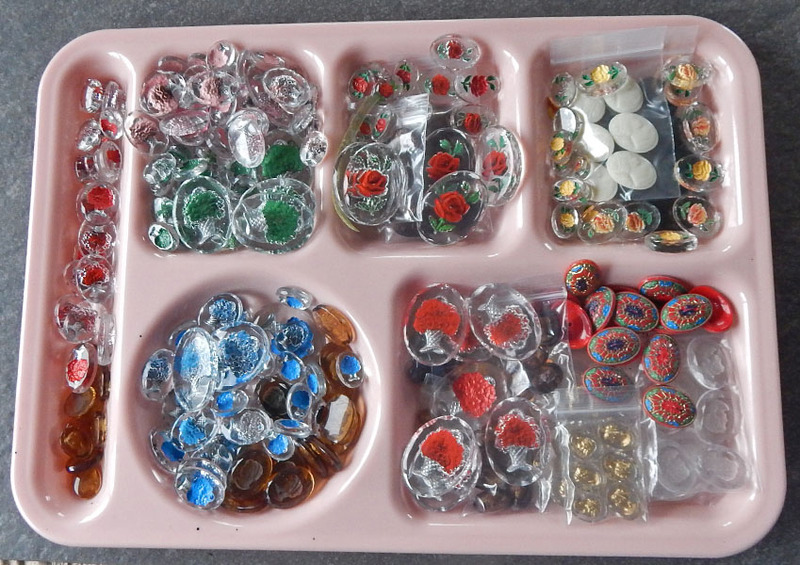 My current project is the stash of old glass intaglios pictured here. For a frame of reference, they’re sitting on one of those “old school” lunch trays. It is packed full of quirky old glass cabs and cameos, most of which are colorful reverse painted intaglio stones. Intaglios are “images created by cutting, carving or engraving into a flat surface” , and in the case of these old stones, the image is often painted from the back side, which adds beautiful color and texture when viewed from the front. While it may not look like a huge stash, there’s a nice variety of styles and sizes here. As such, it will probably take me a good while to get them all photographed and listed. It will definitely be worth the effort, though. I’m excited to be able to add to my selection of old intaglio stones! Next post: Which beading techniques would you like to learn?